A number of liars have tried to link me to the Norway terrorist attacks of 2011. I think the Norway attacks were terrorism. I think Anders Behring Breivik is a terrorist. I think Breivik's manifesto is a terrorist document. I think Breivik should get the death penalty. I think anyone who agrees with Breivik's manifesto should be on a watch list. Breivik wrote about counterjihad issues in 2009-10. What he said was quite normal. That is not just my opinion. The Chief of Norway's intelligence police says it was "moderate" stuff. I said that I agreed with a lot of it, and expressed amazement that the same person would turn into a terrorist the following year. My statement has been taken by liars as implying that I agree with Breivik's manifesto of 2011. But Breivik's manifesto is a totally different document to his earlier writing. It is a terrorist manifesto. The work of a madman. Anyone who agrees with Breivik's manifesto should be on a watch list. So that's it. A lot of fuss about nothing. But liars continue to try to link me to Breivik. What I said (and still say) about Breivik. There is nothing wrong with what I say. Irish-American site IrishCentral mentioned me in an incredible 2011 article on the Norway attacks that was like a drunk repeating rumours he heard from someone else's Google search. 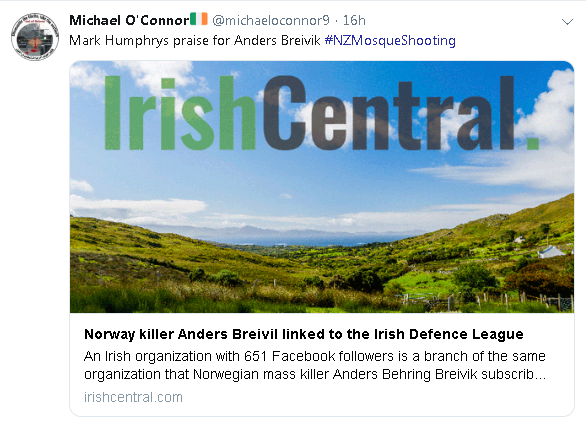 Norway killer Anders Breivil linked to the Irish Defence League, IrishCentral, July 25, 2011. Yes that's right. The name of the killer is spelt wrong. That is the quality of the "research" in this article. The article as published in 2011 had a subheader which has since vanished. Oddly, the name of the writer has changed too. 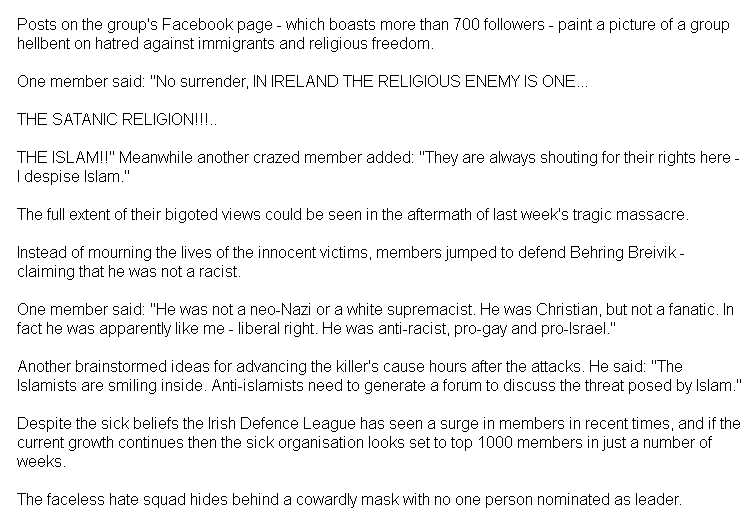 The article suggests a link between Breivik and a Facebook group called the "Irish Defence League". Fact: There is no link between Breivik and the "Irish Defence League". 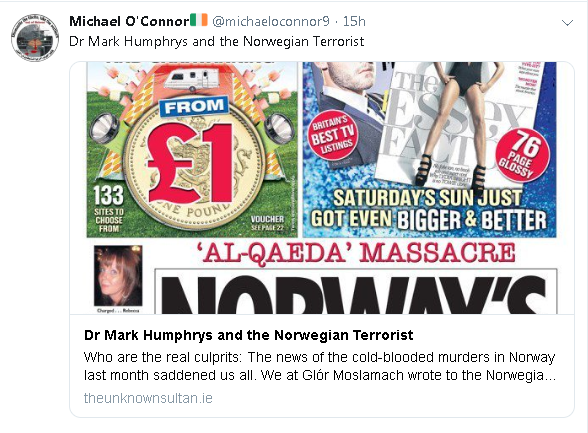 The article suggests a link between the "Irish Defence League" and the prominent American counterjihad site Gates of Vienna. Fact: There is no link between the "Irish Defence League" and Gates of Vienna. The article suggests a link between Breivik and Gates of Vienna. Fact: There is no link between Breivik and Gates of Vienna. They despise him. The article suggests a link between the "Irish Defence League" and me. Fact: I never heard of the "Irish Defence League" before I read the article. Almost every sentence in the article is wrong. So how did this random Googling get into print? I think I know. See the following. Above, Gates of Vienna picked this up and linked to me. 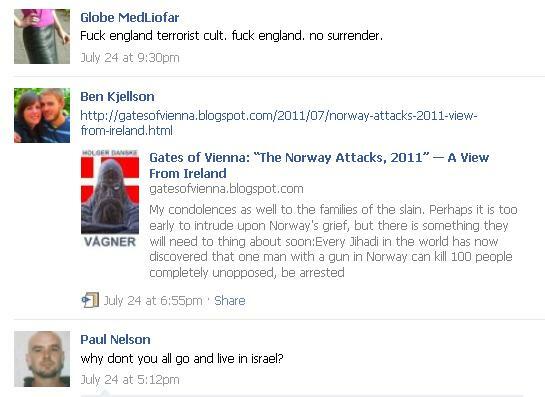 Then, someone on the "Irish Defence League" Facebook site links to Gates of Vienna. It is not even the "Irish Defence League" itself linking to Gates of Vienna. It was just a visitor to their page! A visitor B to Facebook group I posts a comment in which he links to site G which writes a post about person M (me). Therefore ... M is a member of group I! So that's it. That's the "research". Is this the crappest piece of journalism ever? She writes an article on the Irish Defence League, and the only human actually quoted is me - someone who's never even heard of the Irish Defence League! She could have searched my site for the words "Irish Defence League" and she would have found no mention of them. She could have found my writings about the English Defence League where it is clear I am not a fan. But all of these would require "work". Much easier to do 5 minutes drunken Googling and print a bunch of chaotic lies. I put this correction up in the comments on the IrishCentral page. The lies were repeated by Conor Sheils in the Irish Sunday Mirror on 31 July 2011. Though luckily the journalist did not include my name in his drivel. 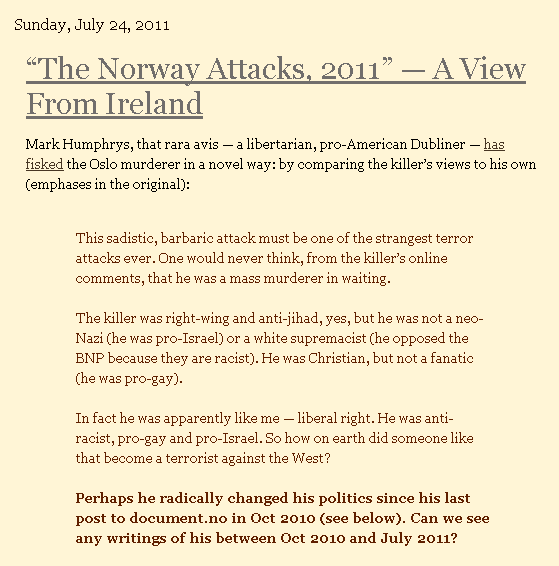 Oddly, while my link to Breivik is nonexistent, IrishCentral itself admires terrorists. 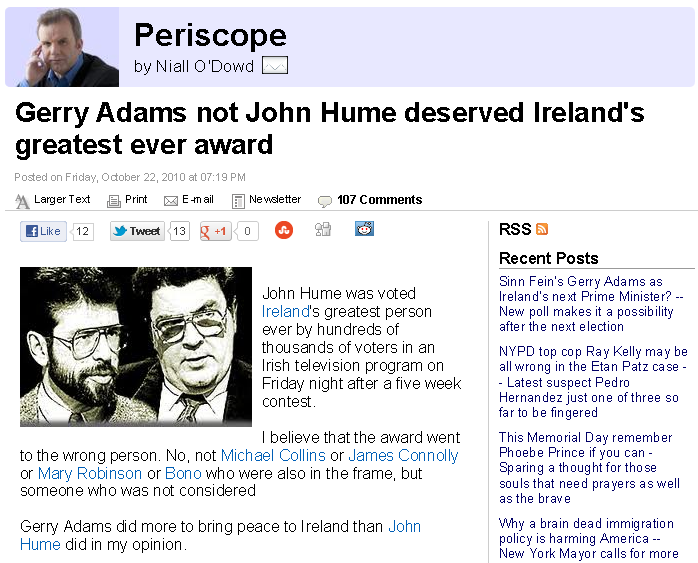 Here the founder of IrishCentral, Niall O'Dowd, declares on IrishCentral on October 22, 2010 that the IRA terrorist leader Gerry Adams is the greatest person in the history of Ireland no less. An Israel-hating, pro-shariah, Muslim reactionary called Qasim Afridi is spreading these lies about me. Qasim Afridi, 1 Sept 2011, slanders me as a "racist bigot" who engages in "vilification of Ireland's Muslim population." He lies that I am a fan of Breivik. Someone called John O'Brien promotes Qasim Afridi's lies about me, 12 Aug 2018. 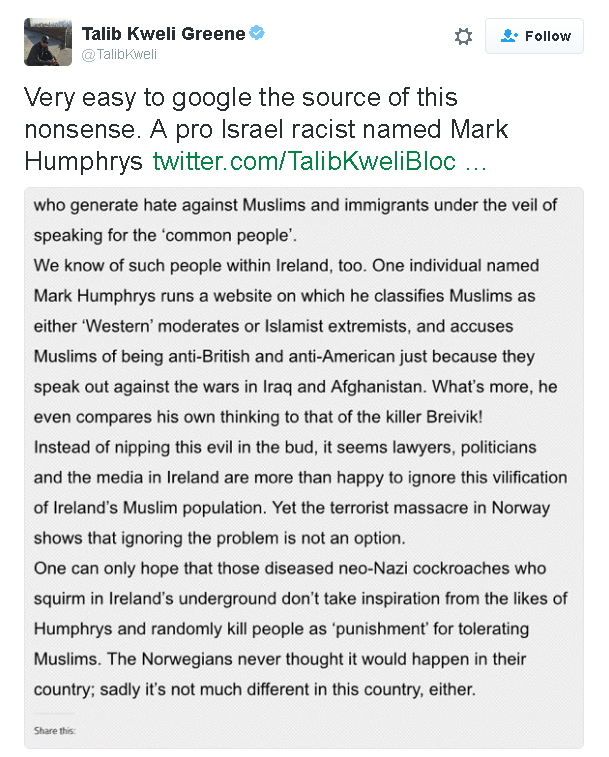 He says: "Mark Humphrys stokes the flames of hatred and inspires Rightwing Fascists like Anders Breivik". John O'Brien lies that I am linked to terrorists. 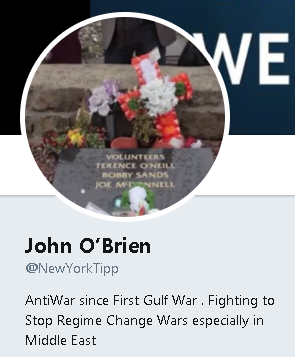 John O'Brien himself is linked to terrorists. On his profile page he displays his support for IRA terrorists Terence O'Neill and Bobby Sands and Joe McDonnell. Idiot celebrity rapper Talib Kweli repeats the same lies about me. Talib Kweli reposts Qasim Afridi's lies and calls me a "racist", Sept 2016. Kweli is a liar. So is Afridi. 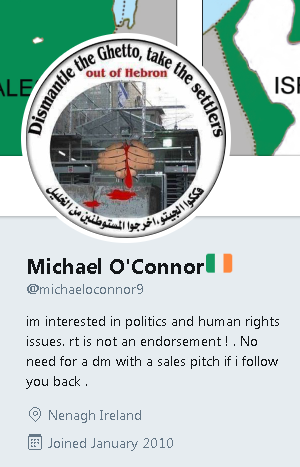 Michael O'Connor is an Israel-hating extremist from Co.Tipperary who has lied about me repeatedly, not just on this issue. I have received endless foul abuse and libel from this hateful man. All because I support the liberal democracy of Israel and oppose radical Islam. His twitter is a call for the ethnic cleansing of the Jews of Hebron to be carried out again. What a thing for a non-Jewish Irishman to obsess over - that Jews are living in Hebron, 2,500 miles away in the Middle East. That makes him angry. It is the top thing that makes him angry about the world! Michael O'Connor spreads IrishCentral's drunken lies about me. Michael O'Connor spreads Qasim Afridi's malicious lies about me. Return to The Norway attacks.